A small bite from a cat or kitten can range from minor to severe. Cats have sharp, pointed teeth that may be able to puncture through human skin. There is bacteria on your skin and a lot of bacteria in a cat’s mouth. When a cat tooth punctures your skin, it pushes bacteria into the wound. The wound may be small and because of that, skin cells rejuvenate quickly sealing the bacteria inside. 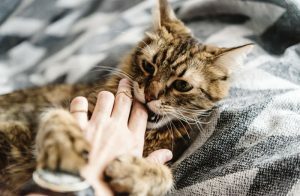 Cat bites get infected 85% or the time, unlike dog bites. Therefore, even tiny cat bites should not to be ignored. Bites to the hand are particularly prone to getting infected. Call 911 if the person has been seriously wounded, or bleeding can not be stopped after 10 minutes of firm and steady pressure, or if bleeding is severe. If you can control the bleeding, and the wound is manageable you should immediately clean and protect the penetrated area. Try to find out if the animal was up to date on its vaccinations, specifically for rabies. What is the treatment for a cat bite? The healthcare provider will make sure the wound is thoroughly clean and may prescribe antibiotics to ensure that no further infection develops. Augmentin is the most common antibiotic used for cat bites because of the specific type of bacteria in the mouth of cats. If severe, the provider may numb the wound and look for any deeper damage. These wounds are normally left open to drain as closing them increases the chance of infection. If there is any risk of rabies infection, it may be recommended for you to receive anti-rabies treatment at the local health department. A Tetanus booster will also be offered to you during your visit if you are not up to date. Ibuprofen or acetaminophen may be administered for pain. How can I prevent Cat bites in the future? When dealing with unfamiliar cats or animals examine its behavior. Cats often bite or scratch in response to stress or in self-defense. Provide toys and other sources of entertainment for cats. Avoid putting fingers close to the cat’s mouth. See our Physicians and P.A.s at Doctors Urgent Care for the highest quality medical evaluation and treatment. We are familiar with and treat cat bites regularly.